Robert Hansen abducted, raped and murdered at least 17 women on the outskirts of Anchorage, Alaska in the early 1980s. He kept a map of the Alaskan wilderness and used it to mark where he transported the women via his small plane, set them loose and hunted them like wild game. At the conclusion of “The Frozen Ground,” based on the events that led to the real-life serial killer’s capture, a photo montage of these victims plays before the closing credits. It feels a little off. Not that first-time feature writer/director Scott Walker’s heart is in the wrong place. I think it’s a genuine tribute, just not one that fits cleanly after the procedural nature of the film that came before. Teenage prostitute Cindy Paulson (Vanessa Hudgens) is found handcuffed and crying in a seedy motel, telling police how she was abducted and raped, but escaped her captor. She has his details, cops know who this guy is, but Hansen (John Cusack) has an alibi. In a somewhat confounding opening we bounce from Cindy to Alaska State Trooper Jake Halcombe (Nicholas Cage) who is investigating the disappearances of several young women. Though we understand what is going on, there isn’t a common thread that connects the story elements early on and the order of events is murky, but not in an interesting way. It has a perfunctory sense of inevitability and we’re just waiting for events to play out that lead to the trooper’s confrontation with Hansen. Any potential presented by the casting of Cage and Cusack is lost. Cage is the complete opposite of his over-the-top style of the last couple decades, and while restraint would be appropriate considering the nature of the real-life events, there is no reason for him to be completely lifeless. He has a blank stare most of the time that signals more disinterest than horrified affectation. 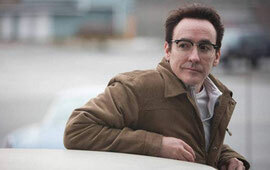 Cusack lets his glasses and folksy accent do most of the characterization. A stutter comes out when the plot requires it to. What could’ve been an emotional core of the film – the interrogation of Hansen by Halcombe – is hamstrung by an odd decision to intercut it with phone calls to the team searching Hansen’s home for evidence. Fits and starts weaken the rising tension level in the interrogation room. This is a common problem throughout, with “The Frozen Ground” often playing like an episode of “Law and Order: SVU” – minus the mystery. The film doesn’t seem to realize it needs to build to what we know the conclusion is. Instead, it plods through a repetitive flatlining of standard plot mechanizations. Paulson’s life in the world of pimps, strip clubs and prostitution is there because it has to be, not because it enlightens or depresses. The only glimpses into her character and history are presented by stilted dialogue from Hudgens. She should be credited for having the ability to make everything sound genuine despite its artificiality. There is nothing fresh or interesting in the way the story unfolds; it has a made-for-TV feel that is perfectly efficient yet utterly disposable.